When using Motive, the main View pane will always be docked in the center. If desired, additional view panes can be opened under the View tab or by clicking icons on the main toolbar. * signifies this option is only available with Motive:Body. Opens a context menu to select pre-defined 3D views. 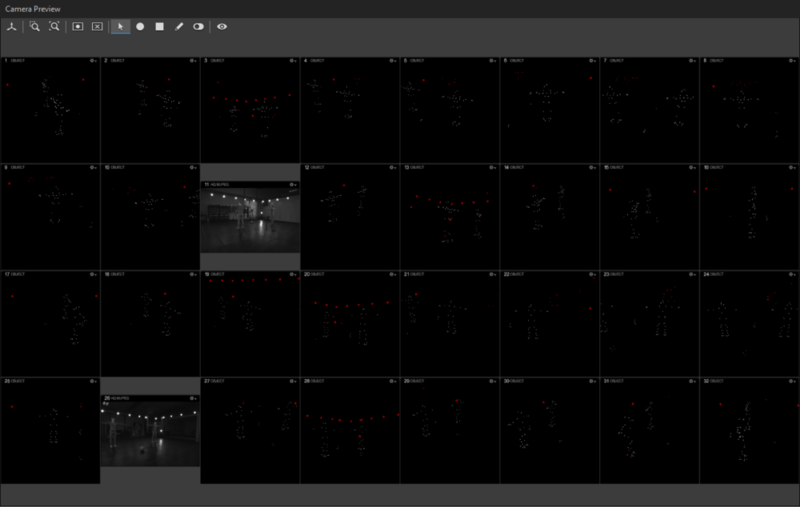 Opens a context menu to select a camera to set as the 3D Viewpoint. Opens a context menu to select a rigid body to set as the 3D Viewpoint. Enable/Disable the follow selected marker feature, skeleton, or rigid body in the perspective view during both capture and playback. Zooms into selected markers or assets to fit the perspective view pane. Zooms into existing assets to fit the perspective view pane. Select Tool. Using this tool, you can select objects that are in the 3D view pane. Translate Tool. * Using this tool, you can select a group of reconstruct markers and apply translation along the global x-y-z axis. When the Edit Skeleton is enabled, this tool can also be used to translate skeleton bones along x,y,z of the segment axis or the global axis. This feature is supported for post-processing of a recorded 3D data only. When the change is made, the segment hierarchy will be modified and reflected on exported skeleton bone data but the marker locations will remain the same. Axis. * This determines whether the global coordinate axis or the local segment axis would be used When applying translation, rotation, or scaling tools to recorded 3D data. Local Axis (LCL): The changes will be applied in respect to the local coordinate axis of the selected asset. Global Axis (GCL): The changes will be applied in respect to the global coordinate axis of the capture volume. Enable Assigned Marker Selection. * When this feature is enabled, you can select on expected marker positions (transparent) of skeleton and rigid body assets. For the skeleton assets, this can be used to remove assigned markers from corresponding definitions. For more information: Skeleton Tracking page. 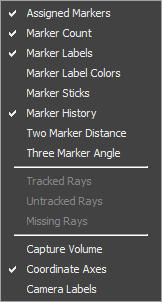 Assigned Markers: Show/Hide expected, or assigned, marker positions that allow auto-labeling of markers for tracking assets. Marker Count: Show/Hide reconstructed and selected marker counts at the bottom-right corner of the view. Marker Labels: Show/Hide marker labels for the selected markers. Marker Label Colors: Show/Hide unique marker color for better distinguishing multiple marker labels within an asset. Marker Sticks: Show/Hide marker sticks for skeleton assets. Marker History: Show/Hide marker trajectory history trail. Two Marker Distance: Show/Hide marker distance information that appear when two markers are selected from the 3D view. Three Marker Angle: Show/Hide three marker angle that appears when three markers are selected from the 3D view. Tracked Rays: Show/Hide Tracked Rays from the view. Tracked rays are the marker centroid rays (available only in 2D data) from each camera that contributes to the 3D reconstruction. Untracked Rays: Show/Hide Untracked Rays from the view. Untracked Rays are the marker centroid rays (available only in 2D data) that are seen by each camera but does not contribute to the 3D reconstructions because the reconstruction requirements, usually the ray count, are not met. Capture Volume: Show/Hide virtual scope of the tracking capture volume based on the camera calibration. Coordinate Axis: Show/Hide global coordinate axis at the left-bottom corner of the 3D view. Camera Labels: Show/Hide camera labels from the 3D view. Toggle to show/hide markers from the perspective view. Toggle to show/hide rigid bodies from the perspective view. Edit Skeleton*. When this feature is enabled, users can translate, rotate, and rescale individual bone segments of skeleton assets within a recorded 3D Take. Symmetrical bone length and orientation* When this feature is enabled, any modifications on bone lengths and orientations are applied symmetrically on both left and right side of a skeleton. In the 3D perspective view pane, you can quickly check 3D distance between a set of two markers. First of all, make sure to enable the Two Marker Distance feature under the visual aids, and select two markers to measure the distance from. Then, the corresponding displacement (in mm) between two markers will be displayed on the view port. Likewise, an angle formed by three markers can also be examined. Make sure the Three Marker Angle display feature is enabled under the visual aids. When this feature is enabled, the respective angle (in degrees) will be measured and displayed over the viewport when a set of three marker is selected from the scene. Note that the selection order will determine the vertex point when measuring the angle. Changes Viewport to 3D Perspective View. Auto-masks all visible markers in every camera. Clears all masking in all camera views. Activates a tool for drawing or removing circular masks on the cameras depending on whether the additive or the subtractive mode is selected. Activates a tool for drawing or removing rectangular masks on the cameras depending on whether the additive or the subtractive mode is selected. Activates a tool to do manually draw or erase masks on the cameras depending on whether the additive or the subtractive mode is selected. This button toggles between additive masking or subtractive masking mode. Depending on this configuration, you can either add masks or remove masks using the above tools. Camera Info: Show/Hide camera specific information, including camera models, camera setting values, time, data transfer rate, frame ID, and sync methods. For Prime series cameras, image board temperature information will also be available. If there is any synchronization or hardware issues, they will also be indicated in the camera info. Marker Coordinates: Show/Hide (x,y) coordinate information for the reflections that satisfy the 2D object filter. Marker Centroids: Show/Hide centroid crosshairs for the reflections that satisfy the 2D object filter. 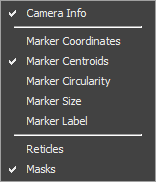 Marker Circularity: Show/Hide circularity value label for detected reflections. The label will appear red if the reflection does not satisfy the 2D filter setting. Marker Size: Show/Hide number of pixels involved in each reflection. The label will appear red if the reflection does not satisfy the 2D filter setting. Marker Label: Applicable when tracking active LED markers. Show/Hide label ID for each marker. Reticles: Show/Hide marker reticles to indicate where the reconstructed markers are located in respect to the camera view. Masks: Show/Hide masked regions in each camera view. The following context menu appears when a camera is selected either in the perspective view or in the camera preview. Video Type: Sets video types of the selected cameras. Hardware Mask: Sets masking of the selected cameras. You can apply auto-masks or clear existing masks. Settings: Configures camera settings of selected cameras. The settings include Camera exposure, threshold, intensity, and other advanced settings that could also be configured in the Devices pane. Orientation: Adjust display orientation of a camera in the 2D camera preview. It can be manually configured or set to a calculated orientation which is obtained from the system calibration. Show Field of View: When enabled, it displays expected field of view in the 3D perspective view. Save View As Image: Saves the 2D view of the selected camera into a bitmap image. Identify: This feature is used to check which camera is selected in the camera preview pane. 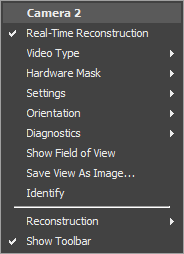 Reconstruction: Enable/disable selected cameras from contributing to real-time reconstruction of 3D markers. The following context menu appears when 3D reconstructed markers are selected in the perspective view. Add Selected Markers to Rigid Body: Adds a selected marker to a rigid body asset. 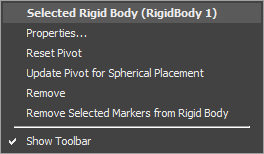 To use this feature, a marker and a rigid body must be selected together. Remove Selected Markers from Rigid Body: Removes a selected marker from a rigid body asset. To use this feature, a rigid body marker and an associated rigid body must be selected together. 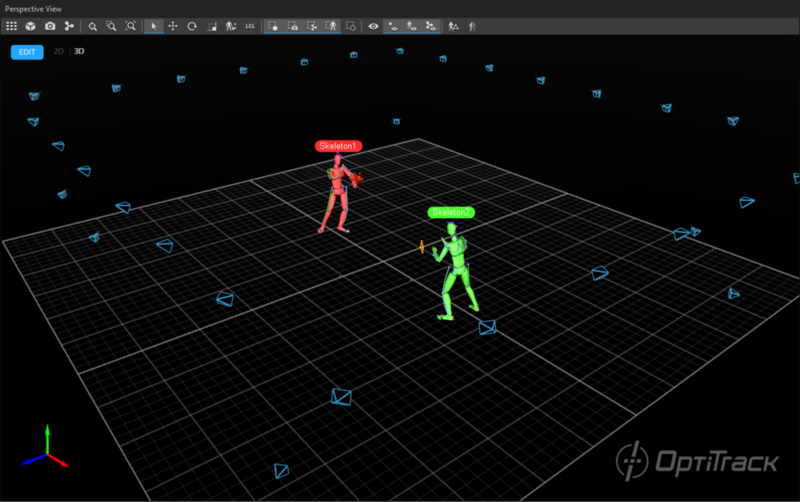 Set Pivot Point to Selected Marker: Sets the pivot point of a rigid body asset on a selected marker. To use this feature, a rigid body and a marker must be selected together. Marker Info: Shows marker label and its x,y,z location within the global space. Label Marker: Assigns marker labels from an existing marker set. Unlabel Marker(s): Unlabels selected markers. The following context menu appears when a rigid body is selected in the perspective view. Properties: Opens the Properties pane and lists out associated properties of a selected rigid body. Reset Pivot: Repositions the rigid body pivot point at the center of a rigid body. Update Pivot to Spherical Placement: This feature assumes that the markers are placed on a spherical object, and repositions the rigid body pivot point right at its center. Remove: Removes a rigid body. Remove Selected Markers From Rigid Body: Removes the selected rigid body marker position from the rigid body asset definition. In order to do this, Enable Skeleton Assigned Marker Selection , must be enabled to select the rigid body marker definition. The following context menu appears when a skeleton asset is selected in the perspective view. Enable Tracking of All Skeletons: Enables all skeleton assets in a capture or in a recorded Take. Disable Tracking of All Skeletons: Disables all skeleton assets in a capture or in a recorded Take. Enable Tracking of Selected Skeletons: Enables selected skeleton assets in a capture or in a recorded Take. Disable Tracking of Selected Skeletons: Disables selected skeleton assets in a capture or in a recorded Take. Show Last Good Pose: When this feature is enabled, the skeleton asset will keep its last good pose when the tracking is lost. More specifically, enabling this feature prevents skeleton solver from trying to solve bone segments with unlabeled markers, and last good pose will be retained for the untracked segments; preventing erratic movements when tracking of a skeleton is lost. Remove All Skeletons: Removes all skeleton assets from a capture. Remove Selected Skeletons: Removes selected skeleton assets from a capture. Remove Selected Markers from Skeleton: Removes selected skeleton marker from the skeleton asset definition. In order to do this, Enable Skeleton Assigned Marker Selection , must be enabled to select the skeleton marker definitions. The following context menu appears when a force plate is selected in the perspective view. Set Position: Repositions a force plate asset according to the location of the calibration square. This is used to calibrate the position of a selected force plate within Motive. For more information: Force plate setup page. Zero (all): Zeroes, or tares, all selected force plates. ReSynch (all): For triggered synchronization protocols, (e.g. force plates that syncs using the record trigger), this feature re-synchronizes force plates with the camera system. This will remove any sync offsets that may have increased gradually since the trigger. This page was last modified on 31 August 2017, at 16:25.